During the last week in particular, several plainclothes judicial police were seen patrolling the area around the space while surveilling and noting down everything they saw; as well, various cars and trucks were seen driving in circles, taking photos of the auditorium and menacingly approaching those who they “recognized” as people involved with the squat. They have also gone to peoples’ homes asking about specific individuals, threatening them with arrest. Yesterday, while a cultural event was happening in the auditorium, one of our compañeros was violently detained at the exit of University City near Base One. Around 9:50pm, Jorge, accompanied by three other people, was headed to his truck to leave. A truck without license plates stopped in front of them, out of which climbed around ten judicial police who, punching him and at gun point, put Yorch in their vehicle without showing any identification or giving any explanation for the reasons for his capture. His location was unknown for more than three hours until he communicated that he was in an office of the Federal Attorney General in the center of the city. The supposed charges are for drug dealing. A totally false accusation. Today, various media outlets attempted to address the issue. The behavior of the police is obvious given the stigmatization our compañero is facing at the moment. The media and their smear campaign, as always on the side of the powerful, is orchestrating a farce in which compañero Yorch is but one piece in their kaleidoscope. For us, it is not coincidence that this event has happened, given the long series of events through which, without any argument, they try again and again to set their sights on the eviction of Che Guevara, always under the pretext of problems the university itself is facing. Given, on the one hand, their inability to understand the political and transgressive dimensions of the squat and the organizing it is carrying out and, on the other, the impossibility – even with all their learning – of understanding that the university is nothing more than one point inside the system, they desperately try to impose their own logic about what they believe happens in the space and the areas around it. They create a scenario of drug dealing and trade which serves as legitimate justification for the repression carried out against Okupa Che and its supporters. They take what they claim to know of the structures of the informal economy in order to insist that in the corridor of the Department of Philosophy and Letters there exists an organization like that of Alejandra Barrios, which charges for territory, controls, expels, accepts and profits off of those who make a living from the sale of various products. It’s clear that trade has grown in the corridor, as it has grown all over the university and all over the city and all over the country as a result of the lack of employment or the desire to not live life in a low-paying and degrading job. The university’s board of trustees is angered by what seems the corridor’s uncontrollable informal economy where many vendors set up precisely because they are tired of being nickeled and dimed by this same board which does charge for and controls the resources of others’ labor. May it be clear that here, in the corridor, there does not exist any charge, or territory, or sections, or leaders, or ringleaders that need to be understood and even less, sought out. On the other hand, under the pretext of drug trafficking they have carried out countless operations that allow, encourage and legitimize the use of force not only by UNAM Security, but by “specialized police” who now have their own space next to the University Metro and free transit throughout all of the autonomous University City. They unleash false and sudden operations against the university community and countless others who have, literally, the “appearance” of being consumers or sellers of drugs. They tirelessly repeat the stereotypes created by the media about this “type” and under that pretext finger whoever they want as suspicious. Moreover, in the case of compañerxs politically linked to some project or space, this pretext has been used to detain, torture and even eliminate them. An example of this was the murder of our compañero Carlos Sinuhé Cuevas in 2011, just as with our compañero “Yorch” at this moment. The war occurring around drugs and its security paradigm are determining factors that justify acts of this type. Understanding the dimensions of drug trafficking is the work of some of the scholars who claim to own this house of study (ha!). Finding those responsible would lead the police to look for the networks that sustain it from the inside of power, as drugs are comparable to any other product within the capitalist system and therefore that is its base. Since the brutality of the police and the complicity of the university authorities can’t justify an attack on the squat as is, drug trafficking networks are invented which validate these despotic acts against our compañerxs whose appearances are deemed suspicious. As if this were not enough, UNAM, in its “report” about the events, supports such actions by declaring that our compañero Yorch is “from outside of the University,” rationale which does nothing but support acts of this magnitude happening on campus, reiterating yet again that the life and “freedom” of those who aren’t students are not defensible and masking the actions of the police and the responsibility and complicity of the Office of the President. For this reason, we call for solidarity in the face of these events. 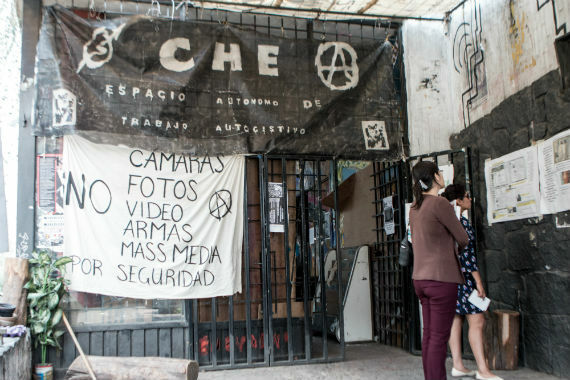 We call for people to be on alert in the face of possible arrests and the forecasted eviction of the squat which for several years has seemed to be the coveted cherry on the cake being chewed on by UNAM authorities and the federal government. We hold the university authorities and the federal government responsible for the arrest of our compañero Yorch and for the false accusations against him. As well as for the upcoming “denunciation of events,” that is to say the acts of repression which will certainly be unleashed against those close to the squat in the coming days. We once again repeat we will not ask their approval to be free. 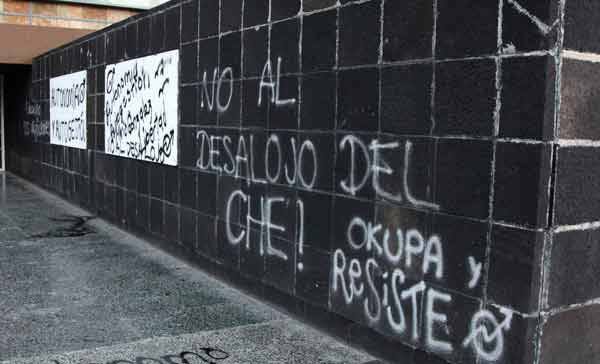 This entry was posted in Mexico, Translations and tagged auditorio che guevara, Jorge Emilio Esquivel Muñoz, mexico, okupa che, repression, translation, unam, yorch. Bookmark the permalink.